Reagan was not a tax cutter, he was a tax raiser? 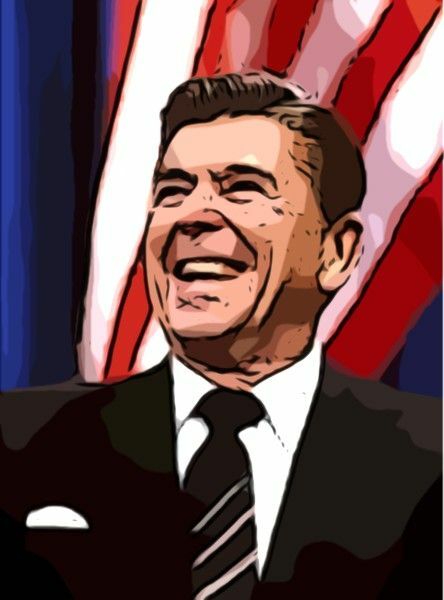 With all the uber-conservative positioning on the debt ceiling and cries for standing true to the Reagan legacy of not raising taxes on the rich – oops, I mean the “job creators” – and only cutting taxes, I thought it would be a good idea to revisit the truth about Ronald Reagan’s “revolutionary” tax cuts; first, yes Virginia, there is a Santa Claus, and yes Ronald Reagan did cut taxes; sort of. However, these wonderful, growth expanding, job creating, economic exploding tax cuts never fully took effect. You see, they were scaled back in 1982 by a tax increase averaging some $37.5 billion over its first four years. Second, part of the Reagan tax cut myth is that everyone “never had it so good” as they did under Reagan. Well, again sort of; however, the economy actually grew slightly faster under President Clinton, and, according to Congressional Budget Office estimates, the after-tax income of a typical family – adjusted for inflation – rose more than twice as much from 1992 to 2000 as it did from 1980 to 1988. While President Reagan rammed a huge 1981 tax cut through a Democrat controlled Congress, he had to follow it with two large tax increases. Fact of the matter is no peacetime president has ever raised taxes so much on so many people. Yes, you heard that right; NO PEACETIME PRESIDENT HAS RAISED TAXES SO MUCH ON SO MANY PEOPLE! The first two Reagan tax increases came in 1982. That year, he signed into law the Tax Equity and Fiscal Responsibility Act which raised taxes by $37.5 billion per year, and the Highway Revenue Act of 1982 which raised the gasoline tax by another $3.3 billion. These increases, coming only a year after his “monumental” tax cut were needed because the budget projections used to justify the 1981 tax cut were outrageously over optimistic. Over all, the 1982 tax increases undid about a third of the 1981 cut; and truth be told, as a share of the Gross Domestic Product, the increase was substantially larger than Mr. Clinton’s 1993 tax increase. In fact, according to the United States Treasury Department, TEFRA alone raised taxes by almost 1% of the G.D.P., making it the largest peacetime tax increase in American history. Listen carefully ditto-heads, because I want you to remember, Ronald Reagan oversaw the “LARGEST PEACETIME TAX INCREASE IN AMERICAN HISTORY”. President Reagan’s next tax increase was known as the Social Security Reform Act of 1983. Its key provision was an increase in the payroll tax that pays for Social Security and Medicare hospital insurance. For many middle- and low-income families, this tax increase more than undid any gains from Reagan’s income tax cuts of 1981. This is a tax increase that lives on, because it initiated automatic increases in the taxable wage base. Thanks to President Reagan, those with moderately high earnings see their payroll taxes rise every single year. Once again ditto-heads, thanks to whom? Come on, you can say it, thanks to Ronald Reagan. According to 1980 Congressional Budget Office estimates, middle-income families with children paid 8.2 percent of their income in income taxes, and 9.5 % in payroll taxes. By 1988 the income tax share was down to 6.6 % — but the payroll tax share was up to 11.8 %. The increase in the payroll tax share outweighed, or canceled out, any benefit from lowering of the income tax share paid. OK, now wait just a darned minute! Reagan passed the historic Tax Reform Act of 1986, achieving in startling clarity his supply side goal of lowering individual income tax rates; well, not quite. The “historic” Tax Reform Act of 1986 in reality imposed the largest corporate tax increase in history. OK “ditto-heads”, repeat after me, “THE LARGEST CORPORATE TAX INCREASE IN HISTORY”. With the simple stroke of his pen, Reagan raised corporate taxes by $120 billion over five years and closed corporate tax loopholes worth about $300 billion over that same period. It means tax cuts during a recession do not work. They didn’t work for Ronald Reagan in 1981, and they certainly didn’t work for George W. Bush in 2001. Tax cuts during a recession coupled with increased federal spending really do not work. Reagan cut taxes and increased federal spending in order to fight, and win, the cold war. George W. Bush cut taxes and increased federal spending to fight the war on terror, and to fund his invasion and occupation of Iraq. So, what are the differences between Reagan and Bush? Reagan understood his tax cuts were hurting the economy, and did a 180 turn and increased taxes – in spite of what Rush, Hannity, et al claim – while George W. Bush plowed straight ahead off the cliff. First, Ronald Reagan oversaw the largest peacetime tax increase in American history. Second, Ronald Reagan imposed the largest corporate tax increase in history. Did Reagan Really Cut Taxes? During today’s bloviations, Rush, while supposedly giving a eulogy for Jack Kemp, attempted yet again to sell the country on the righteousness of the supply-side genius that was Ronald Reagan. He tried to promote the idea that Reagan’s cuts brought about untold economic prosperity, and literally drove the country out of the recession that had helped propel him into office. According to Rush, Reagan’s tax cuts were revolutionary, and helped create the longest sustained economic growth in American history. Now for a little truth about Ronald Reagan’s “revolutionary” tax cuts; first, yes Virginia, there is a Santa Claus, and yes Ronald Reagan did cut taxes. Sort of. However, these wonderful, growth expanding, economic exploding tax cuts never fully took effect. You see, they were scaled back in 1982 by a tax increase that averaged $37.5 billion over its first four years. Second, part of the Reagan tax cut myth is that everyone never had it so good as they did under Reagan. However, the economy actually grew slightly faster under President Clinton, and, according to Congressional Budget Office estimates, the after-tax income of a typical family – adjusted for inflation – rose more than twice as much from 1992 to 2000 as it did from 1980 to 1988. While President Reagan managed to ram his huge 1981 tax cut through a Democrat controlled Congress, he had to follow it with two large tax increases. Fact of the matter is, no peacetime president has raised taxes so much on so many people. Yes, you heard that right, NO PEACETIME PRESIDENT HAS RAISED TAXES SO MUCH ON SO MANY PEOPLE! The first two Reagan tax increases came in 1982. That year, he signed into law the Tax Equity and Fiscal Responsibility Act which raised taxes by $37.5 billion per year, and the Highway Revenue Act of 1982 which raised the gasoline tax by another $3.3 billion. These increases, coming only a year after his “monumental” tax cut were needed because the budget projections used to justify the 1981 tax cut were wildly over optimistic. Over all, the 1982 tax increases undid about a third of the 1981 cut; and truth be told, as a share of the Gross Domestic Product, the increase was substantially larger than Mr. Clinton’s 1993 tax increase. According to the United States Treasury Department, TEFRA alone raised taxes by almost 1 percent of the G.D.P., making it the largest peacetime tax increase in American history. Listen carefully ditto-heads, because I want you to remember, Ronald Reagan oversaw the “LARGEST PEACETIME TAX INCREASE IN AMERICAN HISTORY”. President Reagan’s next tax increase was known as the Social Security Reform Act of 1983. Its key provision was an increase in the payroll tax that pays for Social Security and Medicare hospital insurance. For many middle- and low-income families, this tax increase more than undid any gains from Reagan’s income tax cuts of 1981. This is a tax increase that lives on, because it initiated automatic increases in the taxable wage base. Thanks to President Reagan, those with moderately high earnings see their payroll taxes rise every single year. Once again ditto-heads, thanks to who? Come on, you can say it, thanks to Ronald Reagan. According to 1980 Congressional Budget Office estimates, middle-income families with children paid 8.2 percent of their income in income taxes, and 9.5 percent in payroll taxes. By 1988 the income tax share was down to 6.6 percent — but the payroll tax share was up to 11.8 percent. The increase in the payroll tax share outweighed, or canceled out, any benefit from lowering of the income tax share paid. Well, not quite. The “historic” Tax Reform Act of 1986 in reality imposed the largest corporate tax increase in history. OK ditto-heads, repeat after me, “THE LARGEST CORPORATE TAX INCREASE IN HISTORY”. Once again, Rush proves that he doesn’t know what he’s talking about.